Youth in Murmansk defied rain and warnings from FSB and teamed up for Alexey Navalny’s public meeting. Across Russia, now also in Murmansk, Alexey Navalny speaks anti-corruption to crowds of people. On Friday, the charismatic blogger drew youths to the Leningradsky square in the Park of Victims of Intervention. 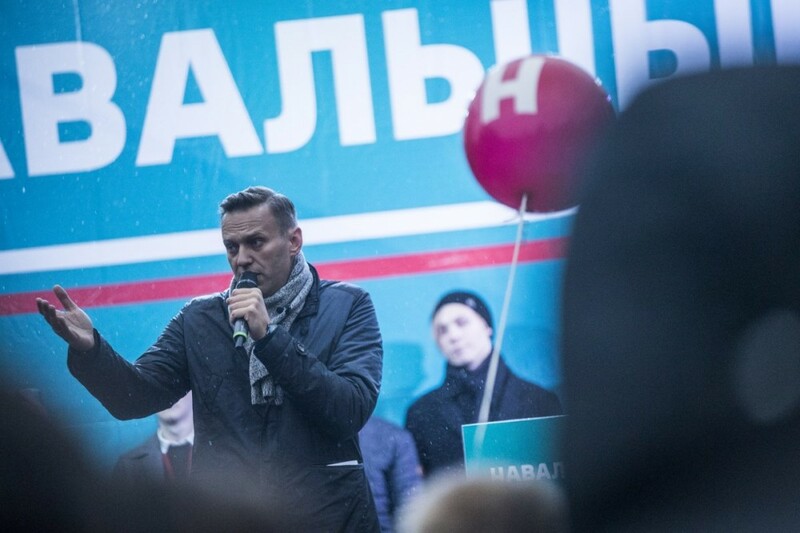 Murmansk was first stop on Navalny’s autumn tour in campaigning for the presidency. Challenging Vladimir Putin for next year’s election is, however, not unproblematic. According to Navalny, teachers at School No. 1 in Murmansk had on request from the local government announced that students who attended the public meeting should register on lists which would be submitted to the FSB. Youngsters in Murmansk were obvious not too scared by the alleged warning. Navalny’s own portal claims there were about 3,000 people participating. Local Blogger 51 estimates the number to be between 600 and 800. The crowd was whatever one of the largest public political meetings in post-Soviet times in Murmansk. «We’ll break through. The people are behind us,» Navalny said from the stage downtown Murmansk. Russia’s high-level corruption is Navalny’s main political target. Earlier this year, he posted a video claiming Prime Minister Dmitry Medvedev had channeled illegal payments into luxury real estate. Other videos have revealed how high-ranking officials and their family members have wealth, luxury and real estate far beyond what they can afford from their official pay-checks. Navalny draws thousands of supporters in rallies across Russia. After Murmansk, he went to Yekaterinburg and Omsk. In March, Alexey Navalny orchestrated the largest anti-corruption protests in years with rallies in about 100 cities. Over the last few years, he has been in and out of jail for participating in - and organizing - illegal protests. Last December, Navalny announced his candidature for the presidential race. Shortly afterward, a court repeated its sentence from 2013, which was previously annulled after the European Court of Human Rights ruled that Russia had violated Navalny’s right for a fair trail. Be re-launching the sentence, Russian law might prohibit his official registration as candidate. Convicted criminals can’t run for president in Russia. The 2018 Russian presidential election will take place on 18 March.